NOTE: First published in Great Britain by Queen Anne Press Limited. COVER: At last, here is the definitive guide to successful backgammon, written by one of the world's leading professional instructors. Beginner or proficient player, you will have much to learn from this unique description of the intricacies of playing the game. Obviously you must make optimum use of every roll of diceand that means looking ahead, anticipating your opponent's moves, and calculating the odds. Study this book carefully, and you will be in a position to do all three, giving yourself the best possible chance of success. The author has found that the most effective way of teaching the game is predominantly visual, so he makes full use of diagrams and tables to illustrate each important point. Two colours are used throughout to enable clear identification of the two players and their respective moves. Most of the examples used are taken from actual games between experts, so that you can learn from the mathematical and strategic analysis of their techniques. 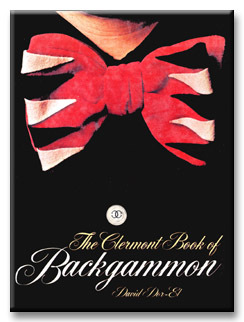 As Victor Lownes says in his forward: "To the really expert backgammon player, it isn't only a game. It's the very quintessence of life."